Faithful duplication of a cell’s epigenetic state during DNA replication is essential for the maintenance of a cell’s lineage. One of the key mechanisms is the recruitment of several critical chromatin modifying enzymes to the replication fork by proliferating cell nuclear antigen (PCNA). Another mechanism is mediated by the dual function of some histone modifying enzymes as both “reader” and “writer” of the same modification. This capacity allows for parental histones to act as a seed to copy the modification onto nearby newly synthesized histones. In contrast to the vast quantity of research into the maintenance of epigenetic memory, little is known about how the recruitment of these maintenance enzymes changes during stem cell differentiation. This question is especially pertinent due to the recent emphasis on cell reprogramming for regenerative medicine. Figure 1A Chromatin modifying enzymes bound by PCNA while on the DNA duplex. PCNA recruits these chromatin modifying enzymes directly or via an intermediate protein. Four main sets of modifying enzymes are shown, each with a unique effect on chromatin. Figure 1B Assembly of histone octamers onto the daughter strand at the DNA replication fork. The parental octamers dissociate into two H2A-H2B dimers and a single (H3-H4)2 tetramer, which are then transported across the replication fork and deposited onto the daughter duplexes. This distribution is random and thus the daughter octamers are likely to contain both a newly synthesized and parental H2A-H2B dimer as well as either a newly synthesized or parental (H3-H4)2 tetramer as displayed in the diagram. The newly synthesized H3-H4 dimers are carried across the replication fork by ASF1 and CAF-1 prior to forming a tetramer and deposition onto the daughter DNA duplex. The newly synthesized H2A-H2B dimers are likewise deposited onto the daughter duplex via NAP1. Figure 1C Duplication of histone modifications from parental to daughter octamers via enzymes or complexes with both a recognition and catalytic capacity. These enzymes recognize a modification present on the parental (H3-H4)2 tetramer and then mediate the same modification onto the daughter tetramer, allowing for propagation of the modification. While these molecular interactions explain how a handful of key chromatin modifying enzymes are recruited to the replication fork, it remains largely unknown how PCNA and other replication proteins replace their recruitment partners in a locus-specific manner while the replication fork is rapidly moving along the parent DNA duplex. The primary cue for the locus-specific recruitment is thought to be provided by the recycled parental histones on the daughter DNA duplex as described next. Nucleosome disassembly and reassembly during DNA replication have been thoroughly reviewed in references.19–21 The parental DNA duplex is unwound during replication by the replicative DNA helicase complex mini-chromosome maintenance 2-7 (MCM2-7). The interaction between histone octamers and the DNA duplex is destabilized during this process. The parental histone octamers are dissociated into two H2A-H2B dimers and one (H3-H4)2 tetramer, which is then randomly distributed onto the two daughter DNA duplexes. This means that the covalent modifications on the parental H2A-H2B complex are diluted by half in the reassembled histone octamer by a newly incorporated H2A-H2B counterpart. On the other hand, newly incorporated (H3-H4)2 tetramers have to establish appropriate modifications de novo. Many in vitro experiments demonstrated that the two H2A-H2B dimers are first released with the support of the FACT (facilitates chromatin transcription) chaperon.20 This is followed by the release of the (H3-H4)2 tetramer, which is more tightly bound to DNA than H2A-H2B, by another chaperon anti-silencing factor 1 (ASF1). It has been shown that FACT is recruited to the replication fork through a direct or indirect interaction with MCM2-7.22 However, whether the same processes take place in vivo remains to be established. Parental histones transferred onto the daughter DNA duplex serve as templates to duplicate the same modifications by recruiting their respective modifying enzymes (Figure 1C). Several prominent histone modifying enzymes possess both a recognition and catalytic domain within the same protein molecule or complex. This dual capacity has the advantage of duplicating the same histone modification to nearby histones once a seed modification is provided. 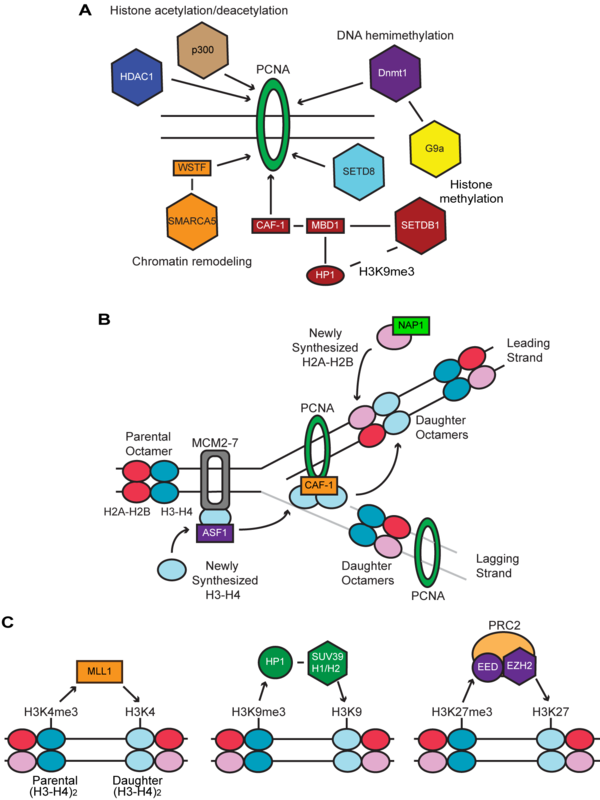 For example, the histone methyl transferase mixed lineage leukemia 1 (MLL1) induces the euchromatin marker H3K4me3 and binds to this same modification through the plant homeodomain (PHD) finger domain within MLL1.28 The heterochromatin marker H3K9me3 is mediated by suppressor of variegation 3-9 homolog 1 (Suv39H1) and Suv39H229 and recognized by HP130,31 which interacts with Suv39H1.32 The SETDB1–H3K9me3–HP1 connection mentioned earlier could also reinforce this interaction at the replication fork. Another heterochromatin marker, H3K27me3, is mediated by the enhancer of zeste homologue 2 (EZH2) subunit in polycomb repressive complex 2 (PRC2) and recognized by another subunit embryonic ectoderm development (EED).33 While these examples illustrate how a given histone modification can be inherited on daughter histones around the DNA replication fork, little is known about how these self-propagating histone modifications terminate excessive extensions to neighboring histones. The study of the field of epigenetic maintenance of cell identity during replication is even more significant due to recent advances in the cell reprogramming field that challenge the cells identity. This link between DNA replication and cell differentiation/dedifferentiation has been a major question in stem cell biology. A classic example is the activation of oocyte-specific genes in somatic nuclei injected into Xenopus oocytes.34 Because the oocyte cytoplasm does not induce DNA replication in the injected nuclei, activation of oocyte-specific genes in the injected somatic nuclei was interpreted as evidence for the change of cell fate independently of DNA replication. More recently, it was shown that the efficiency of forming induced pluripotent stem (iPS) cells is dependent on the number of cell cycles they underwent.35 Other works indicate that a rapidly proliferating cell population is the primary source for iPS cells in a given culture dish.36,37 The speed of proliferation could be related to metabolism, senescence, and other cell physiology; however, the number of DNA replications in these experiments may also be an important determinant for the efficient change of the epigenetic state of parental cells by providing a vulnerable time-window for erasure of epigenetic memory. A more thorough understanding of the mechanism underlying the preservation of epigenetic memory during DNA replication would contribute to the effective maintenance and differentiation of stem cells as well as more efficient cell reprogramming. N.K. was supported by the NIH (R01 GM098294, R21 CA187232, and R21 AR066158); Engdahl Family Foundation, Adjacent Possible Grant from the Stem Cell Institute, University of Minnesota and Grain-in-Aid of Research, Artistry and Scholarship, University of Minnesota (22802). Mechali M. Eukaryotic DNA replication origins: many choices for appropriate answers. Nat Rev Mol Cell Biol. 2010;11(10):728–738. Alabert C, Bukowski–Wills JC, Lee SB, et al. Nascent chromatin capture proteomics determines chromatin dynamics during DNA replication and identifies unknown fork components. Nat Cell Biol. 2014;16(3):281–293. Campos EI, Stafford JM, Reinberg D. Epigenetic inheritance: histone bookmarks across generations. Trends Cell Biol. 2014;24(11):664–674. Margueron R, Reinberg D. Chromatin structure and the inheritance of epigenetic information. Nat Rev Genet. 2010;11(4):285–296. Probst AV, Dunleavy E, Almouzni G. Epigenetic inheritance during the cell cycle. Nat Rev Mol Cell Biol. 2009;10(3):192–206. De Biasio A, Blanco FJ. Proliferating cell nuclear antigen structure and interactions: too many partners for one dancer? Adv Protein Chem Struct Biol. 2013;91:1–36. Naryzhny SN. Proliferating cell nuclear antigen: a proteomics view. Cell Mol Life Sci. 2008;65(23):3789–3808. Chuang LS, Ian HI, Koh TW, et al. Human DNA–(cytosine–5) methyl transferase–PCNA complex as a target for p21WAF1. Science. 1997;277(5334):1996–2000. Hasan S, Hassa PO, Imhof R, et al. Transcription co activator p300 binds PCNA and may have a role in DNA repair synthesis. Nature. 2001;410(6826):387–391. Huen MS, Sy SM, van Deursen JM, et al. Direct interaction between SET8 and proliferating cell nuclear antigen couples H4–K20 methylation with DNA replication. J Biol Chem. 2008;283(17):11073–11077. Milutinovic S, Zhuang Q, Szyf M. Proliferating cell nuclear antigen associates with histone deacetylase activity, integrating DNA replication and chromatin modification. J Biol Chem. 2002;277(23):20974–20978. Esteve PO, Chin HG, Smallwood A, et al. Direct interaction between DNMT1 and G9a coordinates DNA and histone methylation during replication. Genes Dev. 2006;20(22):3089–3103. Shibahara K, Stillman B. Replication–dependent marking of DNA by PCNA facilitates CAF–1–coupled inheritance of chromatin. Cell. 1999;96(4):575–585. Reese BE, Bachman KE, Baylin SB, et al. The methyl–CpG binding protein MBD1 interacts with the p150 subunit of chromatin assembly factor 1. Mol Cell Biol. 2003;23(9):3226–3236. Sarraf SA, Stancheva I. Methyl–CpG binding protein MBD1 couples histone H3 methylation at lysine 9 by SETDB1 to DNA replication and chromatin assembly. Mol Cell. 2004;15(4):595–605. Nestorov P, Tardat M, Peters AH. H3K9/HP1 and Polycomb: two key epigenetic silencing pathways for gene regulation and embryo development. Curr Top Dev Biol. 2013;104:243–291. Poot RA, Bozhenok L, van den Berg DL, et al. The Williams syndrome transcription factor interacts with PCNA to target chromatin remodeling by ISWI to replication foci. Nat Cell Biol. 2004;6(12):1236–1244. Li Q, Zhang Z. Linking DNA replication to heterochromatin silencing and epigenetic inheritance. Acta Biochim Biophys Sin (Shanghai). 2012;44(1):3–13. Annunziato AT. Assembling chromatin: the long and winding road. Biochim Biophys Acta. 2013;1819(3–4):196–210. Ransom M, Dennehey BK, Tyler JK. Chaperoning histones during DNA replication and repair. Cell. 2010;140(2):183–195. Alabert C, Groth A. Chromatin replication and epigenome maintenance. Nat Rev Mol Cell Biol. 2012;13(3):153–167. Foltman M, Evrin C, De Piccoli G, et al. Eukaryotic replisome components cooperate to process histones during chromosome replication. Cell Rep. 2013;3(3):892–904. Sobel RE, Cook RG, Perry CA, et al. Conservation of deposition–related acetylation sites in newly synthesized histones H3 and H4. Proc Natl Acad Sci USA. 1995;92(4):1237–1241. Loyola A, Bonaldi T, Roche D, et al. PTMs on H3 variants before chromatin assembly potentiate their final epigenetic state. Mol Cell. 2006;24(2):309–316. Groth A, Corpet A, Cook AJ, et al. Regulation of replication fork progression through histone supply and demand. Science. 2007;318(5858):1928–1931. Mello JA, Sillje HH, Roche DM, et al. Human Asf1 and CAF–1 interact and synergize in a repair–coupled nucleosome assembly pathway. EMBO Rep. 2002;3(4):329–334. Ito T, Bulger M, Kobayashi R, et al. Drosophila NAP–1 is a core histone chaperone that functions in ATP–facilitated assembly of regularly spaced nucleosomal arrays. Mol Cell Biol. 1996;16(6):3112–3124. Wang Z, Song J, Milne TA, et al. Pro isomerization in MLL1 PHD3–bromo cassette connects H3K4me readout to CyP33 and HDAC–mediated repression. Cell. 2010;141(7):1183–1194. Peters AH, Kubicek S, Mechtler K, et al. Partitioning and plasticity of repressive histone methylation states in mammalian chromatin. Mol Cell. 2003;12(6):1577–1589. Lachner M, O'Carroll D, Rea S, et al. Methylation of histone H3 lysine 9 creates a binding site for HP1 proteins. Nature. 2001;410(6824):116–120. Bannister AJ, Zegerman P, Partridge JF, et al. Selective recognition of methylated lysine 9 on histone H3 by the HP1 chromo domain. Nature. 2001;410(6824):120–124. Aagaard L, Laible G, Selenko P, et al. Functional mammalian homologues of the Drosophila PEV–modifier Su(var)3–9 encode centromere–associated proteins which complex with the heterochromatin component M31. EMBO J. 1999;18(7):1923–1938. Margueron R, Justin N, Ohno K, et al. Role of the polycomb protein EED in the propagation of repressive histone marks. Nature. 2009;461(7265):762–767. Gurdon JB, Partington GA, De Robertis EM. Injected nuclei in frog oocytes: RNA synthesis and protein exchange. J Embryol Exp Morphol. 1976;36(3):541–553. Hanna J, Saha K, Pando B, et al. Direct cell reprogramming is a stochastic process amenable to acceleration. Nature. 2009;462(7273):595–601. Ruiz S, Panopoulos AD, Herrerias A, et al. A high proliferation rate is required for cell reprogramming and maintenance of human embryonic stem cell identity. Curr Biol. 2011;21(1):45–52. Guo S, Zi X, Schulz VP, et al. Non stochastic reprogramming from a privileged somatic cell state. Cell. 2014;156(4):649–662. ©2015 Colleoni et al. This is an open access article distributed under the terms of the Creative Commons Attribution License , which permits unrestricted use, distribution, and build upon your work non-commercially.